Multi-coloured traffic jams and shopping frenzies are back in Thailand. So are the tourists. The government is promising to call elections before June. It has announced a pump-priming package of measures to support the informal economy and the vast numbers of Thais who live off it. Economic growth in 2010 exceeded some analysts' predictions. But the more sober economists remain deeply concerned about the country's prospects. Perhaps that's only logical, because of the politics, the casual observer might say. Last year, by the time the army moved in twice to clear protests by anti-government groups known collectively as the red-shirts, a total of 91 people had died. Five-star hotels were closed for weeks, tourists terrified, and several businesses intending to invest in Thailand decided against it. They remembered, too, the December 2008 closure of the international airport by "yellow-shirt" protesters. Foreign direct investment figures for Malaysia benefited as a result. But last year's numbers suggest that blaming politics for economic developments, or the lack of some, does not make sense. Those numbers show that Thailand continued to export throughout the troubles and this sector continued to underpin strong growth. "There seems to be a fundamental disconnect between industry and politics," said Oliver Fall, editor of the Business Report Thailand. "Thailand remains export-led so business carries on regardless of politics in Bangkok," he said, pointing to the Eastern Seaboard industrial area, a few hours drive' east of the capital. Certainly the political instability has deterred new investors from coming into the country, but those already here, including large-scale Japanese manufacturers - have stayed and invested more for the long term. As one businessman put it: "Business in Thailand succeeds in spite of its governments." With Thailand currently home to armed conflicts on three borders and engaged in two of them - on the eastern border with Cambodia and in the south with a separatist insurgency - business seems to have shrugged off both domestic and regional concerns. But that is too benign a view for other economists. The World Bank has predicted GDP growth of just 3.2% in 2011. Its latest economic forecast says this will be "due to both high base as well as lacklustre demand for Thai exports as the rich countries still grapple with the consequences of the global financial crisis". Indeed, it is precisely the reason cited by the upbeat observers - Thailand's immunity to domestic traumas because its exports are thriving - that carries the seed of Thailand's economic troubles to come. Those who believe the economies of the US and Europe are recovering nicely from the global financial downturn see Thailand as proceeding "steady as she goes". But international analysts are not so hopeful of recovery in the west. "The medium-term global outlook will be marked by an extended period of slower but less volatile growth in the advanced economies," believes the World Bank. "For Thailand, exports to emerging markets and domestic consumption can only offset some of the weaknesses in demand from developed countries," its forecast says. It also highlights the challenges for those making economic policy in Thailand in "managing the large influx of foreign capital arising from interest rates differential with advanced economies and from the region's better growth prospects". That the Thai currency, the baht, has continued to appreciate, has to raise concerns over Thailand's export competitiveness, the Bank warns. The country's future is shadowed by a lack of investment by Thais themselves, and by the government in education. That poses much higher risks than any political turmoil, some economists have warned. The current tendency of large Thai companies to invest abroad, instead of at home, for example, assumes there will be more growth elsewhere, yet adds to Thai balance sheets. 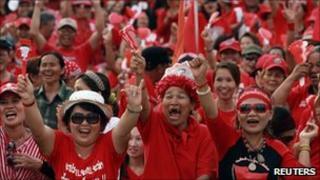 However, it highlights a basic failure in Thailand to recover from the Asian financial crisis of 1997-98. One economist told the BBC that it was not until private domestic investment within the country increased that true confidence could be said to have returned. Thailand is now reaching the limits of its economic model to this date - its manufacturing base has been overtaken by the cheaper wages of near neighbours such as Vietnam and India. If Thailand is to progress, it needs to look at Taiwan and South Korea, where real new growth was fuelled by expansion of a services sector which in turn relies on an educated population. The OECD Pisa tests (Programme for International Student Assessment) produce scores for Bangkok that are comparable with the United States. But the Pisa scores for the country as a whole are much lower - demonstrating one of the points made, albeit in a different manner - by the political protests. There is a large disconnect between Bangkok and the rest of the country, and until investments in education and services are made in areas far from the lavish homes of the business elite, the country as a whole will languish.